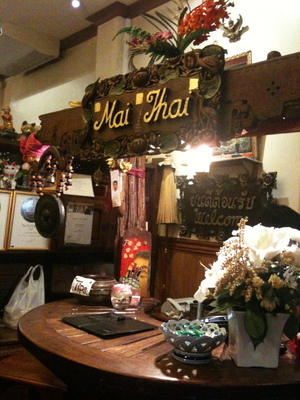 With the warm interior, friendly staff and authentic Thai food taste, 'Mai Thai restaurant' makes a long lasting impression on it's customers. It is definitely a great place to try for dinner on weekends or one of the relaxed week nights. Mouth watering soups and deep fried appetisers give you a great sense of satisfaction and prepare you for the rest of the amazing dinner. It offers a variety of vegetarian dishes. All the dishes have unique authentic flavour and the creamy panang curry is particularly delicious. I would also recommend the duck curry, green or red curry and pad Thai. There are also a few unique choices of rice, which you would not usually find in any Thai restaurant. And last but not the least, sticky rice served with the choice of mango or banana is the sensational dessert offered by Mai Thai. The presentation is often remarkable and flawless. It is also a great place for takeaways and it provides home delivery service for just 4$ for orders of more than 40$. Plenty of parking is available and BWS is just next door. If you are planning to spend a relaxed night in a comfortable atmosphere while enjoying the taste of proper Thai food, Mai Thai is the place to be!